HomeUncategorizedWhat is the best way to sell my things? Buyout Companies that offer a fixed price to buy everything in the home will always offer a liquidation value which is lower than fair market value. The advantage is that they will haul everything away immediately, which is part of why they pay a much a lower price than fair market value, (they are factoring in dump fees and haul away services for items they cannot resell). This is a good solution when there is a short timeline and everything must be out of the house. You may be able to request that the home be left in “broom swept” condition. Traditional Estate Sale Companies invite the public into the home to shop over a 2 to 3 day period. Items are generally sold at liquidation value prices, (some may start at fair market value), and prices are lowered significantly on the last day of the sale. A traditional estate sale works best in homes where people no longer reside. 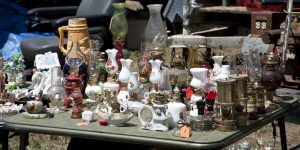 The traditional estate sale might not be as selective as an auction company, because they are willing to sell $5.00 items with the understanding that it all adds up in the end. They usually take a minimum of 35% commission. There can be extra dumpster fee, which is usually about $500.00 deducted from the end proceeds of your sale. Online Auction Companies are your best option for selling smaller and easy to ship collectibles, sterling silver, jewelry and select art. Having very collectible items on an ecommerce platform is likely to maximize the selling price because your bidding audience is larger. Online Auctions are usually not the best solution for selling furniture. Most of these auction companies take a 30%-35% commission and may negotiate a better commission on items that sell for a higher amount. Traditional Auction Companies are a good resource for selling items when the timeline is very short and the items must be out of the house ASAP. They can be a great resource for selling furniture, vehicles, boats, trailers, etc. If you cannot bring the items yourself to the auction house they will charge a moving fee ranging from $50 to $100 an hour that is deducted from the end proceeds of your sale. Some of these local auction companies can be very selective. You will need a representative to come out and walk through the home with you first. A disadvantage may be that the audience is limited in number compared to an online audience. However, many traditional auction companies are starting to sell select items online for clients. Most of these auction companies take a 30%-35% commission. Consignment Shops Consignment shops will try to sell items for as high a price as possible for you, but it may take a couple months. This can be a great solution for fashion items, home decor and furniture in great condition. The shops will be selective about condition and demand in the market. Consignment shops take a commission that can be as high as 55%. They will provide a pick up service for an extra fee. These are great resources if you are selling furniture, exercise equipment, contemporary home decoratives and children’s things. The nice thing about selling through social media sites is that you are interacting with people in your immediate neighborhood/community, they are responsive to the set price you ask them to pay and they usually pay in cash. You eliminate the commission that auction and estate sale companies will charge. You will need to private message the admin in charge of the group and simply request to join. Nextdoor.com will ask to verify your residence in the neighborhood with an address or phone number, because they are strict about allowing only people in your neighborhood to join. Craigslist is a fine place to sell your things if you are comfortable with a variety of strangers contacting you and negotiating. It is like social media markets, but the audience is much larger. It is not an auction, for you set your price and you eliminate the commission that auction and estate sale companies will charge. You will need to establish a free account. Craigslist is a good place to sell lawn equipment, tools, large appliances, vehicles, boats, trailers, exercise equipment and musical equipment including pianos. eBay and Replacements.com…Anything you would sell through an online auction company will sell successfully on eBay. An eBay account is free and you will need to create a Paypal account to feed transactions through, which is free to set up. eBay will charge about 13% total with their hidden listing fees and Paypal takes about 3% of the sale as well. Replacements.com is a company that sells china, collectibles and silver flatware to people that need to add items to their collections. If you send them pictures of your items, then they will quote you an offer to purchase those items. You might make less on Replacements than on eBay because Replacements needs to turn around and sell the items for a profit, but it is a quick and easy solution. Shopify.com and Poshmark.com are the do it yourself solutions for designer clothing, shoes, handbags and other designer accessories. These sites are similar to eBay in that you will do the work yourself and share a similar type of fee. You will set up your own cyber storefronts and put fixed prices on the items you sell.